How do you announce that you’ve moved away (again), without the additional narrative about an amazing job opportunity or logical reason for leaving? You don’t. Instead, you flutter away softly but intently, listening to your heart more than the concerned voices closest to you. “But why the most expensive city in the country? ?” Because I appreciate very expensive things…? This is my first dispatch from the West Coast, and thus a newcomer’s guide to San Francisco. It will evolve over time, but having been here for two months, I’ve made quick work of sniffing out some neat, locals-only spots. For a relatively small city (essentially a 7 mile by 7 mile square) of under 900,000 inhabitants, there are more secrets to uncover than you might assume. The streets and blocks certainly feel denser, the distances longer, than the numbers indicate. As a lover of many cities, my natural inclination is to spot the differences and similarities between a new place and places I know well. But any comparison of San Francisco to other urban agglomerations, domestic or international, is futile. The city contradicts itself, from neighborhood to neighborhood, just as much as it bucks the modern conventions of urban planning and city life that govern many other alpha cities. It’s not a concrete jungle (NY), nor is it spread thin like peanut butter toward the horizon (LA). It doesn’t feel especially old, but neither is it ultramodern. It’s both highly progressive and steeped in tradition, with areas that resemble the grit of New Orleans and others that are very European. I get Lisbon vibes thanks to the hills, which are in fact epic. And though it is 90% right angles in its street grid (thankfully), the topography adds a dimension of complexity in navigation and movement. Historically, the hills separated the workers from the moneyed class. You’ll find that many of the grandest homes live in any one of the “…heights” neighborhoods. Perhaps I am just attracted to complicated, unconventional, and misunderstood environments. Milan is certainly underrated, a narrative I continue to espouse to anyone who would like to debate the merits of Italy’s cities (go to Milan and Naples, skip everything else). And yet, for all its swirling diversity, there are some broad truths about it. Above all, I would say San Francisco is a community comfortable with risk. From early settlement on land surrounded by water on three sides, through devastating earthquakes and (urban + wild) fires, and its residents’ stubbornness in building on precarious terrain, there’s more risk to hedge here than elsewhere. Taken a step further, it’s clear the appetite for risk is reflected in the area’s economy. The region is dominated by entrepreneurs on the bleeding edge and enjoys global prominence as the incubator for innovation. It’s the setting for fantastic successes, like Apple, Google, and Uber…and plenty of spectacular failures. Like a cliff-perched home, there is the potential to lose everything or win big, every day. My guess is that risk predilection may come from the city’s history as a place for dreamers and outcasts, albeit intellectual ones, who’ve had to start over more than once. From the gold rush through mass discharges of gays from the Navy during WW1, and as a settlement for many immigrants from Asia and Latin America, stagnation isn’t a word commonly associated with the city. Reinvention is more accurate. How fitting, then, that I too am here to reinvent myself. In explaining my path to arrive here and now, few have expressed concern. Instead, I’ve mostly received kudos for my boldness and well wishes, offers to help and make introductions. For that risk, and why the area remains so desirable, residents and participants in the system enjoy untold rewards. The natural environment is stunning and dramatic, observable from hilltops, vistas, and roadways etched onto peaks, around and through the city. Many neighborhoods are known for their architecture and design, on display in the many historic homes and mid-rise condo buildings that have been meticulously and painstakingly renovated. I actually love SoMa (south of Market), which is a mix of old and new, industrial, commercial, and residential. And it’s flat (+ usually sunny), which isn’t as novel as a steep hill, but far more practical. The surrounding region is prime territory for outdoor pursuits and recreation on the weekend. Tahoe isn’t far to ski, and some of the best wine is cultivated within an hour of the city. The food scene is fantastic too, with a thousand ethnic options and an emphasis on healthy, brainy ingredients. There are a boggling number of independent coffee roasters who make a perfect Gibraltar (cortadito). And while a newcomer like me can choose from a wide range of industries in which to toil, technology pervades all as the driver of commerce and wealth. Whether or not it is my passion, tech is a central part of modern life across the globe, applicable to all, and thus at the source (here in the city), massively lucrative, necessitating many secondary and tertiary services like logistics, public relations, legal, etc. The challenges, other than an aforementioned risk of the entire city sliding down into flat land or into the ocean? San Francisco weather can be annoyingly fickle within a single afternoon, and totally opposite across town. Generally, the west side is foggier, colder, and windier than the east side. A sweater or light jacket is advisable 24/7/365. And at that, most of the jackets donned are more function over form. The city is less glam than New York or Los Angeles, but still has plenty of exquisite shopping and highly curated boutiques. The upside to being more casual is it’s less pretentious, so if you want to dress up, great. If you don’t, no one notices. And as you probably know, it is numbingly expensive to buy or rent in the city. Okay, but that’s coming true everywhere lately. At least to me, coming from a place I was underwhelmed, you pay a lot here but are given in return a vibrant, thrilling, unmatched urban playground. Transportation is equally challenging, as the city still functions as a nearly 50-50 hybrid between car-dependent and transit-oriented. With a car, you can get all over relatively quickly, with a personal bubble to control. But it’s pricey to park and rare to find a place to park all day for free. There are however many areas that would be difficult to live in without a car, mostly on the west side of town. Conversely, BART (commuter rail, which only touches the east side and downtown areas), Muni (local light rail), bus, and streetcar are the best option in some cases, but often take just as long as walking or driving. Uber and Lyft pick up a lot of slack, but are still costly enough that each trip can average $6 or $7 even if just a half mile or so. What I’ve found is that housing and personal movement to and fro are the most expensive parts of San Francisco. Everything else (eating, drinking, coffee, sundries, movies) are about equal to other cities. That still means spending $15 on average for a healthy lunch, $5 for a coffee, and $12-15 for a movie ticket. Many things, however analog and old fashioned they may be, are free. 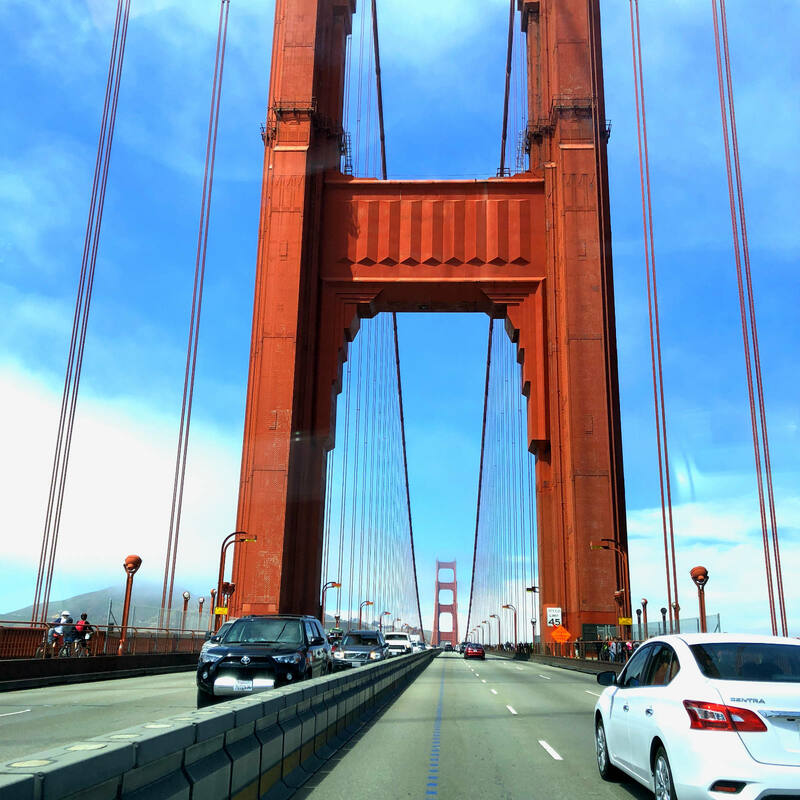 The drive north over the Golden Gate Bridge (into Marin County) is free, though the return trip is an $8 toll. It’s totally touristy and cliché, but the art deco international orange arches are so elegant and dramatic. Rollerblading on The Embarcadero is free, as is attending a screening of Priscilla Queen of the Desert in Dolores Park or strolling around Golden Gate Park, past the Conservatory of Flowers, where the dahlias are currently in bloom (they’re the official flower of San Francisco). Many museums do one day of free admission each month, and street festivals happen every weekend during the summer. My custom map of SF Spots is here. You really grasped the pros and cons of the City, and it’s character, relative to other cities, in this post. As a Bay Area native, I tend to dwell on the negatives brought by tech, but also having lived in Italy, where most cities have dead end tourist driven economies, I count my blessings. Well, with the exception of Milan, an underrated city which I visited a few times, which is how I found your site. Keep up the good work! Thanks for the comment Brian – glad you enjoyed the post! No place is perfect, I have learned. Thanks Brian, for the nice comment!